KEYSTONE CROSSROADS — Republican gubernatorial nominee Scott Wagner released an attack ad Wednesday ripping Pennsylvania Gov. Tom Wolf over education policy. The ad claims Wolf plans to rip money away from rural school districts in order to favor Philadelphia — which the Wolf campaign contended is a complete falsehood. It’s the latest ripple in a wave started a month ago by Wolf’s remarks at a Philadelphia press conference that have surged to the forefront of the education debate in this year’s election. On June 29, the governor appeared at a Philadelphia public school to announce money his administration had set aside for lead remediation in the wake of a series of damning press reports. During a question and answer session, Keystone Crossroads asked Wolf if this sort of one-shot emergency funding was evidence that the state should act more consistently toward needy districts. Keystone Crossroads asked a follow up question to clarify: So you think all the state basic education money should be run through the fair funding formula? This might sound wonky, but it’s a big deal. That formula, made law two years ago, takes into account poverty rates, tax effort and current enrollment numbers for each district in the state — and uses those factors to make school funding decisions. The plan has been to use it only for new increases in money. So far, that means the formula applies to under 10 percent of the state’s roughly $6 billion pot of basic education dollars. But if you use the formula to dole out all state education funding, it’s a massive redistribution that creates clear winners and losers. The biggest winners would be places with significant poverty, steady or growing public school enrollment, and relatively high school taxes. In terms of total dollar amounts, districts including Philadelphia, Reading and Allentown would see huge increases. Districts including Conestoga Valley in Lancaster County, York Suburban, and Wyomissing Area in Berks County would see a major boost in their budgets on a percentage basis. The biggest losers would be districts where enrollment has plummeted, which is the case in much of rural Pennsylvania. In the era before the new formula was enacted, the state favored shrinking districts with a “hold harmless” policy that helped to shelter them from the ill effects of their population loss. The new formula does not retain this policy, and counts actual student enrollment numbers. So, to use the formula fully would mean to gut those districts that have been long subsidized by this policy. There are some advocates who think this makes sense because it would help the majority of students in the state while correcting inequities that built up over years. But the harm it would do in the majority of districts in the state has made the notion a fringe idea, until the day when Wolf made his remarks in Philadelphia. Keystone Crossroads ran a story after that June 29 press conference, noting that Wolf was calling for a drastic change. The story made clear that Wolf offered no hard timeline for when that should happen. A few days later, the Wolf camp wanted to clarify the governor’s position. Yes, the governor supports all dollars through the formula, but not immediately. The changes would “take time” they said, not giving any specifics. But by that point, Wolf’s political opponents seized on what he said in the initial Keystone Crossroads story. They say anything Wolf says now is a flip-flop. It’s since become a full-blown campaign talking point. Wagner’s camp has also created a website where you can see how much your district would lose if all money went through the formula immediately. 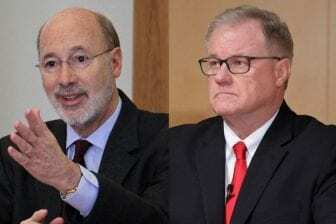 Both clearly attempt to paint Wolf as a governor who favors urban Pennsylvania, and Philadelphia in particular, over the state’s rural areas. Aside from the comments Wolf made at the Philadelphia press conference, Wagner’s campaign is also drawing on a June 21 story in the Philadelphia Tribune. On June 20, the advocacy group POWER met with Wolf’s chief of staff. Following that meeting, the Rev. Gregory Holston, the group’s executive director, indicated to the Tribune that Wolf’s staff “were supportive” of a bill that would drive all money through the formula — and do so immediately. Now, POWER says the governor’s chief of staff only committed to the idea of moving all money through the formula eventually, not immediately. Between that concession from POWER and Wolf’s later clarification of his position, the Wolf campaign says Wagner’s recent tactics are not based in reality. Close aides point out the governor has consistently stumped for more education funding, and gotten it — for all districts in the state. Wolf’s team says the governor only supports using the funding formula completely if there’s enough money in the system to make sure no district is harmed. “Only when there is full, fair and adequate funding would he support putting all money through the formula. There currently is not, and there is no timetable for that to happen,” said campaign spokeswoman Beth Melena. What exactly does that mean? What is full, fair and adequate? But a more scientific calculation can be made based on the formula, and that is how the Wolf camp was characterized as framing the issue last week in an Associated Press story. “Wolf’s aides say he backs a shift when there’s a big enough increase in state aid to put all school aid through the … funding formula without cutting aid to any single district,” said the July 25 story. So how much money would that take? A Keystone Crossroads analysis of state data says the state would need to add $32 billion in new basic education dollars to do that — more than five times what’s currently spent. But this fact underscores how politically and economically difficult it is to fully implement the formula. An immediate shift causes extreme pain to many. A shift that hurts no one is mindbogglingly expensive. And there’s one more twist in this story. Although Wagner is championing rural Pennsylvania now, he used to say that the old distribution system — the one that favored shrinking rural districts through the “hold harmless” policy — was misguided. In previous reports, Wagner has said that his position evolved on this issue after the state enacted the new school funding formula. That evolution had not yet occurred when Keystone Crossroads interviewed him in 2016, four days after the formula was signed into law. Now, his campaign says the current use of the formula is working fine. “Although keeping hold harmless in place for old money presents challenges in terms of the speed in which we can address inequities, it’s the best we can do,” said Wagner campaign spokesman Andrew Romeo. In its own attack ad, the Wolf camp has pointed out that Wagner backed former Republican Gov. Tom Corbett when public school funding was cut in the wake of the Great Recession. They’ve attempted to frame Wagner as an anti-education budget hawk; Wagner has, in the past, suggested some districts and school employees receive too much money. And so, as Election Day nears, both candidates now say the same thing publicly at least on one point: No school district will see its state funding slashed under his watch.